The editor of a Kazakhstani newspaper has asked the management of popular Russian TV channel NTV to clarify why its female presenters seem to have a tendency to wear outfits so revealing that their "mammory glands" are showing. 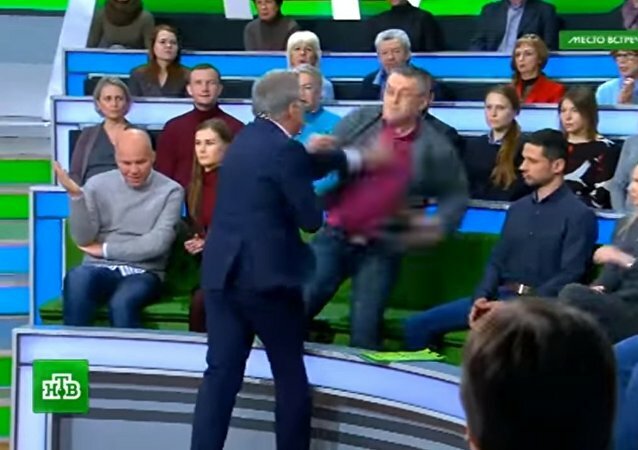 In a live political talk show on Russian television, a war of words between Ukrainian political scientist Dmitry Suvorov and German lawmaker Andreas Maurer over the situation in eastern Ukraine led to a big-time brawl. Iran has called on Turkey to end its offensive in Syria's Afrin as it may help terrorists in the region, state news agency IRNA reported Sunday. Russian NTV broadcaster correspondent Vyacheslav Nemyshev, who was detained by the Ukrainian Security Service (SBU) and then expelled from the country, has already returned to Russia, a spokesperson for NTV told Sputnik Thursday. The Russian Foreign Ministry considers it "an act of discrimination." The Security Service of Ukraine has expelled Russian NTV television correspondent Vyacheslav Nemyshev from Ukraine after detaining and interrogating him in Kiev. A Russian TV correspondent has been detained by the Ukrainian Security Service while on an assignment in Kiev. 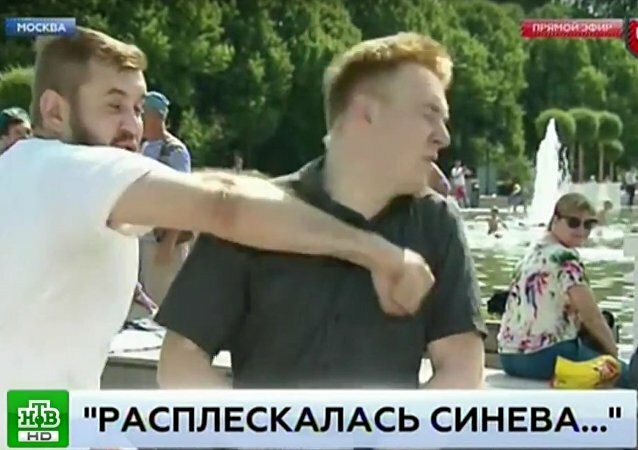 A Russian TV reporter ended up getting assaulted by a drunken man while filming a live report from Gorky Park in Moscow during the Airborne Troops Day celebration. Russia's Investigative Committee is exploring the circumstances of the incident when Russian journalists where shelled by the Ukrainian artillery in Donbas on Tuesday, the committee's spokeswoman, Svetlana Petrenko said. Relations between Turkey and the EU have reached a new low, the two sides issuing increasingly harsh statements against one another. Guldener Sonumut, Turkish television representative in Brussels, told Sputnik that given the EU's panic over Donald Trump's election victory, threats and pressure against Ankara probably won't do Brussels any good. According to the NTV channel, three people were wounded in an IT firm in Turkey’s Istanbul in an explosion. Three rockets hit the Antalya-Kemer road in southern Turkey damaging a warehouse, local media reported Friday. Camera crews of Russian TV-channels Zvezda and NTV say they came under fire in the Syrian city Aleppo. A Russian news crew looking for the relatives and friends of a suicide bomber, who detonated explosives during Friday night’s international soccer game between France and Germany at the Stade de France outside Paris, have been assaulted and beaten up in the Belgian capital of Brussels, the journalists said Thursday. Ukrainian conscripts are going to great lengths to evade military service; recently one even bought the status of a clergyman. Ukraine’s court ruled Friday to suspend the broadcasting of four Russian channels, the press service of the National Television and Radio Broadcasting Council of Ukraine said. Russian President Vladimir Putin has presented the incoming head of new government media conglomerate Rossiya Segodnya with a state award for service to his country. An ill-conceived poll posted online for just 12 minutes is all it took to precipitate the latest turn of the screw on Russia’s constricted independent media scene. The European Court of Human Rights (ECHR) has given top priority to an appeal by two Russians, accused of involvement in the May 6 riot in Moscow last year, against the conditions of their detention. Russian prosecutors and tax inspectors showed up Thursday at the offices of the respected human rights group Memorial to launch a “ comprehensive check,” the organization’s press secretary said, adding that they were accompanied by reporters from pro-government NTV television.